Topps' latest freshman football card offering features a solid checklist, intriguing card design and the potential for high quality hits, but falls short when it comes to delivery - each $80-$90 box delivers a total of four cards, of which only one is a hit. The experience leaves you wishing Topps had chosen to go with a 2-10 pack format. I don't think I have ever suggested doing this, but ripping a case might be the best way to open this product, as there are some insanely valuable cards in Supreme and doing so would assure they wind up in your hands. I would personally seek singles over ripping the product, but if you do feel the itch to rip a single box, you could do far worse than 2010 Topps Supreme. 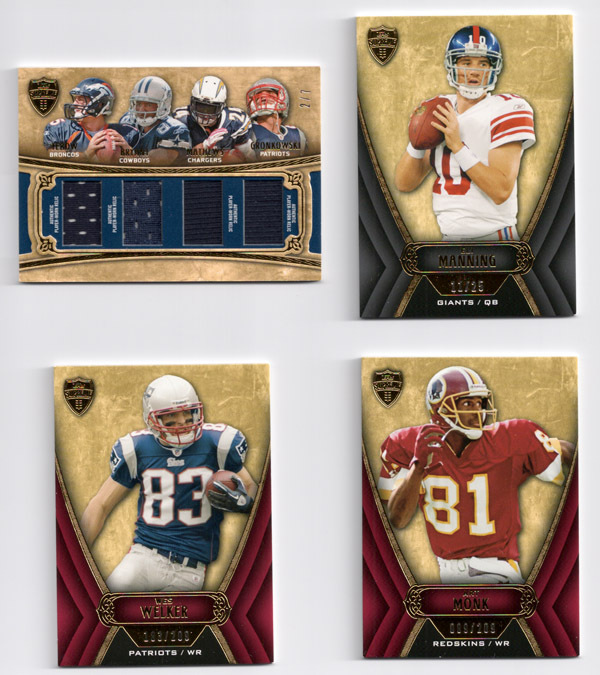 The card design is a melting pot of other 2010 first year Topps football products. The base cards are a thicker, far superior version of 2010 Topps Unrivaled. Supreme's gold color scheme borrows from Topps' upcoming ultra high-end 2010 Topps Five Star (which borrows from Upper Deck's Exquisite Collection). Then there's the relic layout and presentation, which look similar to 2010 Topps Prime. The best looking cards in the product are without a doubt the laundry tag and NFL shield logo relics. Overall, the card design is excellent and highly collectible, it's a shame Supreme is so brief. The checklist does an excellent job of combining past, present and future stars. The absence of "non-hit" inserts is refreshing per usual - these often clutter a product's checklist with worthless and undesirable cards. My biggest complaint with the checklist would have to be the odd player combinations used on many of the multi-relic cards. They often feel forced and make little sense. A perfect example of this is the quad relic I pulled featuring Tim Tebow, Dez Bryant, Ryan Mathews and Rob Gronkowski. They are all solid rookies, yet I don't see the connection between the four of them. Seeing as how this is a 1-hit per box product, this bothered me more than it usually would. The biggest problem with Topps Supreme is how brief each box is. The ideal amount of packs for a product is around 5-10, as it strikes the perfect balance between too many and too few cards. With only 4 cards, one of which is a hit, the margin for error is far too high for my taste. If you have the money, it would make a lot more sense to rip a case versus a single box. With a case, you know you're going to get the craziest card in the case. With a box, you can end up getting burnt fairly easily. That being said, the top tier hits from Supreme have been selling extremely well on eBay, I just don't like the odds of pulling one of these from a 1-pack, 1-hit box. Had this been a 10-pack or 2-hit product, it would have been extremely enjoyable, but as a one pack product, the enjoyability ends before it has a chance to start. Oddly, the most enjoyable part of Supreme was surfing eBay and checking out some of the big time hits such as the aforementioned laundry tag and NFL shield logo relics. If you're a gambling man, then by all means give a box a shot, just be warned that it's a brief, boom or bust experience. At first i was really excited about this release but as far as looks go it reminds me too much of the Topps Unrivaled cards, i did pick up a nice #’d to 25 Jahvid best two patch auto dirt cheap and it might be a relatively inexpensive way to pick up a Tebow or Bradford auto that’s low numbered.